Imanami’s GroupID revolutionizes how your IT department manages Active Directory groups. Our proprietary system ensures that distribution lists and security groups are never out of date. All organizations have distribution lists and the accuracy of such lists is essential to productivity. These lists also ensure cybersecurity for businesses as well as individual users. Despite those facts, an estimated 70% of all organizations don’t have a reliable solution to manage their groups in Active Directory. GroupID’s revolutionary process solves Active Directory problems creating a more productive, safe work environment for companies with more than 500 employees. Our system allows your IT department to control your Active Directory groups in a dynamic and automated fashion. Our system learns and grows as your business changes. Active Directory Groups are as dynamic as their members; these groups must be able to nimbly adjust as users switch responsibilities, job titles and locations. 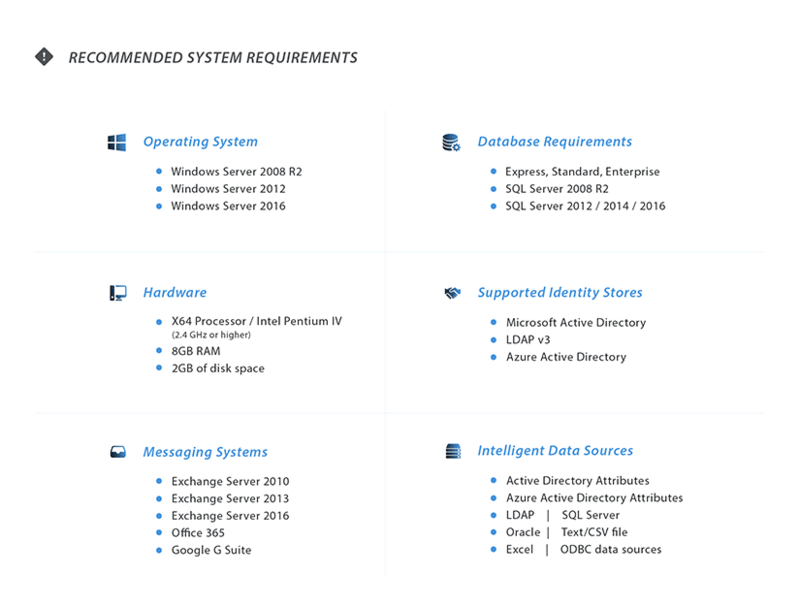 Generally, distribution lists and security groups are manually maintained by the Exchange or Active Directory administrator. GroupID Automate puts an end to these manual processes by automating the creation and management of these groups. Managing Active Directory group membership and user attributes is a tedious job for administrators. Giving a web based self service option allows administrators to delegate active directory administration to end users. But you need controls. GroupID enables end users to update their own directory information and manage groups based on controls the administrators set. Group management is enhanced as users can create and manage their own groups, opt-in and opt-out of groups based on the security setting for that group. Group renewals and expirations are administered and controlled within GroupID Self Service. Save your administrators time and effort by putting control of pertinent data in the hands of the end-users. Password policies can be ramped up on the spectrum from easy to remember to so complex that it is impossible to remember. This should be true for your password reset solution as well. Password Center has been designed to easily fit the environment you are running. From something as simple as the number of questions asked to authenticate to increasing a level of password complexity even stricter than Active Directory requires, Password Center gives the administrator options. Exchange and Active Directory do not provide any reporting tools, so administrators must scroll through the Global Address List (GAL) manually, searching for their targets. Empower your administrators with GroupID Reports, a simple free reporting tool that allows administrators to view or print accurate reports on objects within your directory or GAL. Out-of-the-box, GroupID Reports contains canned reports every administrator cannot live without. GroupID Health Meter adds efficiency to your active directory management system. The Health Meter is a powerful measurement and reporting tool that uncovers potential issues before they cause a security breach or reduction in staff productivity. And… it’s FREE. With a color-coded and numbered grading systems, active directory management administrators can view long-term group lifecycle trends, identify areas for improvement or upgrade, and track progress. GroupID Authenticate is a federation service for all GroupID applications. As one of our most powerful and important active directory admin tools, GroupID Autnenticate verifies a user’s identity against a configured identity store before allowing them to login and use any GroupID module. With GroupID Authenticate, users are provided Single Sign On support across all GroupID modules that use the same identity store.